Kick Asphalt! Max stiff & Max tire. Max Power to accelerate and stop. Max your chassis and max your tire combination. 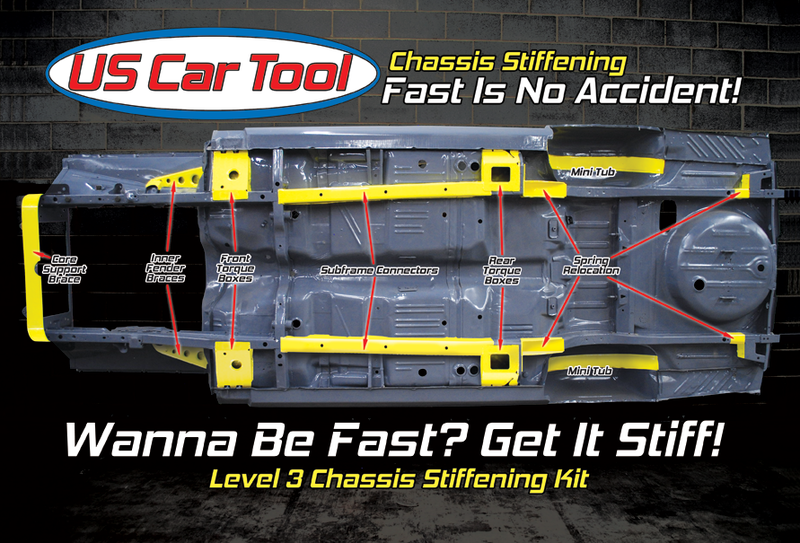 For straight line performance, autocross or canyon carving, the Level 3 kit goes to the Max! Get all the go and whoa to move your car, not twist it. When you want Max Power and Max Traction, get Max Stiff. Add Level 3 and go kick some Asphalt. Save $$$ over individual component pricing by purchasing a level 3 kit. Where does the Level 3 Chassis Stiffening Kit mount? The kit mounts to the unibody of your E-Body Mopar and adds strength and stiffening to the entire unibody structure. This the most complete kit and adds the most strength available, short of adding a full roll cage to your car. Does my car need a Level 3 Chassis Stiffening Kit? Inner Fender Braces add stiffening to a front frame rail system that was prone to twisting. The front Lower Core Support brace connects the extreme front ends of the front frame rails to help make them stronger and less prone to twisting. The Level 3 kits goes further by moving your leaf springs inboard and add space in the wheelhouse tire area for Maximum Tire size and width.